I was a bad blogger last week and I need a little warm up post to get ready for this one. So all I know to do right now is a weekend recap. We had dinner with a really neat couple from our church, My-An and Kevin. Our kids are very close in age and they played great together. I found out My-An potty trained each of her three kids before age two. I'm so inspired! Maybe I'll get brave and try that with Annabeth. Kevin and I realized we had gone to high school together. Curtis was then treated to seeing his wife's ninth grade yearbook picture. Annabeth slept late, so I didn't wake up until 8:20. PTL! If you had told me 10 years ago that one day 8:20 would be "sleeping late," I might not have had kids. They're so worth it though. I woke up to the smell of something cooking and it was my hubby making pancakes! To make a great morning even greater, Mom and I did a little birthday shopping with Annabeth. It started with lunch at Ruggles Cafe, where Annabeth got her own kids meal for the first time. We went to Fleet Feet and Mom got some new walking shoes and I got a pedometer. I can't wait to use it. I didn't run one time last week, so I need to get my rear out of the bed tomorrow and hit the road. AB was having a mini language explosion on Saturday. She started saying "uh oh" and also mimicked me saying "bless you" after she sneezed. Then, to top it all off, as we were checking out at this cute kids boutique I love, she started saying something else. It took us a while to figure it out, but we decided she was trying to say "love you!" I'm sure you can imagine how excited we were. I think she was thanking Bibby for her new birthday frocks. Later we all had dinner at a neighborhood cafe and then Mom took Jackson home for the night. He loved getting to do that. We had church this morning as usual. It was so great. I really missed my boy and couldn't wait to see him. This afternoon I went to a bridal shower for Heather Sproule. Her mama, AKA Mama Sproule, has worked in the youth ministry at our church for years and years and years. She's an awesome lady. It was fun to get together and love on the Sproule girls. It's so weird to be past the bridal shower stage of life and onto baby showers. Our newlywed years seem like they were in a different lifetime. This evening my mom came over and we went for walk in my neighborhood. It was chilly but so pretty outside. Before I sign off, please celebrate with me that I still have not had one french fry in 2010. It was hard when we went to James Coney Island today but I prevailed. Thus far the Lord has helped me! Kristen Howerton has a plan. I'm joining in on my Twitter account. I'm @lpm_amanda. Debra linked to this post today, which explains Ronel's situation in detail. Debra posted an update yesterday. If there's a new one today I'll link to it here. Keep praying! Today I have to do the unthinkable. You know exactly where I'm going with this - all the way to Walmart. With both my kids. Help me, Jesus! I mentioned my dreadful errand to Curtis and he told me he does it all the time and it's no big deal. He's such a warrior. Why am I going to Walmart? That's a very good question. Well, the hair dryer that I bought about six months ago is already kaput. I need a new one along with a bunch of groceries, so there you have it. Target cannot help me today. My hair has looked disgusting for the last week - just in time for the SSMTC and all the pictures that were taken! I finally realized it's because my hair dryer wasn't blowing hard enough and it was also getting too hot. The result has been a greasy, unsightly mess on my scalp. I'm apologize to those of you who've had to see it. It's Curt's fault that my hair appliances have such a short lifespan. He has this habit of laying the hair dryer next to his legs and running it on low for hours on end to warm himself. I've tried so hard to change him with no success. The only thing I can do is guard my new hair dryer like a lioness - a fierce, amazing lioness. And when my hair is restored to its rightful condition of big-ness, my mane with be very lion-like. Now I'm going to transition to a completely new topic. All of a sudden my heart is racing and I feel like I'm going be sick. That's how much I dread talking about this! Or it could be the shrimp pasta I ate from Red Lobster last night. The sauce was very buttery - it gets me every time! The new topic is Facebook. A long time ago I decided that I was going to keep my FB friends limited to people I know in real life. (There are a couple of exceptions and I just need your grace there. This can be complicated.) I share a lot of my life on both of the blogs and I feel at peace with putting a boundary on that. My sister did not agree with me for long time, but she changed her mind a few months ago and whittled down her friends list. Over the weekend she got a lot of questions about it. This is not something I want to have to address on the other blog, but it kind of needs to be addressed. So I'm hoping that it will help a little bit to mention it here. Melissa and I just need a place to be normal. Our friends get overwhelmed by the attention we get because of who our mom is, and we just need a place where we can be Amanda and Melissa-plain-and-simple. It makes me feel sick to talk about this because it sounds so self-important. Bleh! But I think some people may have their feelings hurt over this and I want to say that we're really sorry and that it isn't personal. Thanks for understanding. Or if you don't understand, thank you for extending grace. Now that I've said it and I only got sick once, here's one of my favorite movie scenes of all time. Meg Ryan's character has just eaten a bunch of French cheeses. I woke up early in the morning on Saturday and couldn't go back to sleep. I was staying at a hotel for the Siesta SMT Celebration and was sharing a bed with Marla. Not wanting to wake her up with my tossing and turning, I finally just got up at 4:30 and went into the bathroom. Curt had bought me a new Blackberry hours before, so I thought at least I could mess around with my new phone. I got on Twitter and saw that in those early morning hours there was a lot of drama unfolding. Jamie and her husband were in Orlando getting Amos. Their updates were so exciting. I could not keep from crying. But Debra's messages revealed that Ronel had not been given his travel documents and they were not able to join the other adoptive families in picking up their children. My heart was so broken for her. I cried even more. Maybe one eye was crying happy tears and the other was crying sad ones. Tomorrow Debra's husband, Ernest, will spend all day at the American Embassy in Haiti in an effort to bring their son home. Please, please pray that God will bring great glory and praise to His name by making a way for Ronel to come home tomorrow. What is impossible with man is possible with God. Ask Him to provide a person of peace - even a legion of people of peace - to open up the heavy, creaking doors they are facing. Thank you, friends. I hope to report good news soon! Can You Feel the Bloggy Love? Last summer I emailed Missy at It's Almost Naptime to see if she wanted to host a get together for Houston bloggers. She said yes and we were both excited about it, then one of us flaked. I'll let you guess who it was. Me! Totally me! Thanks to Missy and her bloggy friend Amy, a little meetup happened on Tuesday night. We had a great time over Mexican food. Debra even came and brought baby Jude! He was so adorable, y'all. It made me sad about my baby getting so big. Lindsee Lou called called our blog meetup a "blogup," which is brilliant. I met Lindsee when she came to our LIT Bible study a while back and I've loved getting to know her in person. She has such an amazing heart for the Lord and for ministering to younger girls. She is an absolute jewel. Missy/It's Almost Naptime, Callie/Smith Live, Heather/Step Inside, Debra/One Girl, Kristen/We Are THAT Family, Leslie/The Late Bloomers, Allison/ It Feels Like Chaos, Michelle/ Usr/bin/mom. When we moved back to Houston two years ago, the Lord surprised me with a handful of new and very dear friends through blogging. The first one was Missy B.. She recognized me from the blog and introduced herself after our step aerobics class one night. We had gone to the same college and had volunteered for the same ministry there, but we'd never known each other. We endured many nights of aerobics together before I got pregnant with Annabeth, then wimpy me set out for the next 9 months. Not long after that, Missy was expecting too and we both had girls! It's been a lot of fun to share that. I have loved getting to know Missy and she is one of my favorite people on earth. I can't tell you how many times she's texted me in the morning and told me to look on my doorstep for some yummy baked goods that she dropped off on the way to work. Everyone needs friends like that. Six months after we moved here, I was sitting at our church's women's retreat with some girls from my Sunday school class. There was one extra seat at our table and a girl named Kristy came and sat with us. We didn't talk much and I had no idea how much that tall, beautiful pregnant lady would mean to me in the coming months. She and her husband started coming to Curt's Wednesday night Bible study at our church and we became close friends. Baby Levi was born that November and Annabeth came a few months later. Jackson loves her older boys, Sage and Kolby, to pieces. Kristy is a wise, fun, thoughtful, godly friend who makes me feel like I might be able to make it through this motherhood thing. She was also my moral support when we went to Monster Jam last year and I worried that my water might break and begin the most embarrassing birth story of all time. Last spring I met Heather through the MOPS group we were both attending. Heather had just moved to the area from Nashville. Get this, she found out they were moving while she was still in the hospital after having her third baby. CAN YOU EVEN IMAGINE? I have loved getting to know Heather for the last year. She is so easy to talk to and to laugh with. We have had some fun girl outings around town and even today we were emailing back and forth about a little spa day in our future. Heather might not think this about herself, but she is a strong person and I really admire her. Annabeth is very blessed to be about a year younger than Heather's baby girl, Mollie Kate. Some of AB's cutest clothes have come straight out of her closet. When you're a busy mom you don't exactly have time to meet up with each one of your friends every week or talk on the phone forever, it's neat to be able to connect with them through their blogs. I felt like I knew each of these ladies really well before we had really hung out enough for that. Instant intimacy in a relationship can be a warning sign, so I'm not saying that. What I am saying is that it's cool to get to read what's on your friends' hearts on a regular basis. Now let's talk about something completely vain. I had possibly the worst hair day of my life on Tuesday. I let it air dry too long before fixing it and it was hideous. It was a bummer because I knew pictures would be taken at the blogup. However, the last blogup I went to was at the Proverbs 31 Ministries/KSBJ Girls Night Out last January. (That's when I met Missy@It's Almost Naptime and thought she was the cutest thing ever.) I had closely guarded any pictures of me in my third trimester and very few appeared on my blog. 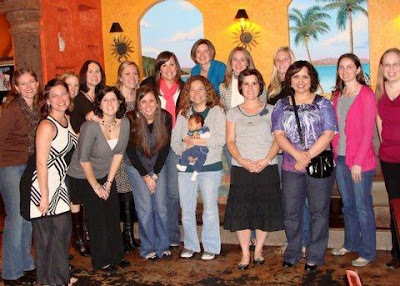 Ironically, about A WEEK BEFORE I GAVE BIRTH TO MY CHILD, I met all of these wonderful bloggers and my huge pregnant face appeared in group pictures on multiple blogs. Awesome, right? No bad hair day could possibly be worse than that. This weekend is the Siesta Scripture Memory Team Celebration for our LPM bloggers. I will be helping host this along with my mom and sister. I absolutely cannot wait! We had a great time at the Siesta Fiesta in San Antonio and this one may be even better because we'll have more time with our girls. Can you feel the bloggy love? It's all over the place! I know there is still an unfathomable amount of needs in Haiti, but I think if I don't stop and celebrate the victories then I will lose heart. It looks like my friends Debra and Jamie will probably have their boys home soon. Praise the Lord! That is such a miracle in the midst of a tragic situation. The earthquake could have delayed their adoptions for years, but instead they are coming home sooner. My little heart is doing back flips. Debra's family is now suddenly in need of a bigger vehicle - one for two adults and four kiddos. (Their youngest is just four weeks old. Can you imagine going through all of this in your post-partum weeks? Seriously.) Ronel's adoption was not even close to the end, so they are delightfully surprised by this news. Join me in praying for God to wildly provide for every single need they have. Personally, I'm praying really big, like that someone will just give them a great SUV. Our God is good, friends. He is mighty and good. One day we will understand why things happen the way they do, but until then we put our faith in who He is and not what He does. And sometimes - a lot of times if we're looking closely - we get to see miracles. One year ago tonight weren't we all sitting at our computers obsessively searching blogs for news about Kelly's baby girl, Harper? What a miracle God did to heal her. It's so fun for all of us who love the Stamps family from afar to get to celebrate their little darling's first birthday. I am really fighting the blues today from all that's going on in Haiti, but I have continually thought of Harper and how God answered our prayers. Thank You, Lord! I'm hoping one day Annabeth and Harper will get to have a playdate. Kelly wrote a really moving post about what this day was like for her last year. You can read it here. I'm getting prepared for Annabeth's little birthday party. Today I ordered the cake, which is the most important thing after the guest of honor herself. I have no idea what it's going to look like, but it's going to taste superb! It will be almond flavored with amaretto icing. Give Him praise, people. If no one likes those flavors, then there will be more for me! Muahahahaha! Sorry. The colors for Annabeth's party are going to be - big shocker - red, pink, and white. And to mix it up I'm throwing in some turquoise. My friend Beth at Love, September is making a fun banner that I can use from year to year. I've ordered some neat little do-dah's to hang from the ceiling that should add to the festivity. The invitations arrived in the mail yesterday. When I was designing them online, I asked Curtis to help me choose between three different styles. I went with the one he picked. So last night I handed him the invite and he grimaced like it was the ugliest thing he'd ever seen. I said, oh so calmly, "YOU PICKED THIS!" I'm sure you can imagine what the next couple of minutes were like. I'm laughing out loud right now. I know this is stupid stuff to talk about (the party, not Harper), but my hubby has been speaking at a Disciple Now on the other side of town all weekend and I have a lot of words stored up. And I need a distraction to keep me from searching the Internet obsessively for news about the Bresma orphanage in Haiti that ran out of water today. Is anyone following that story? I'm praying like crazy, but sometimes my obsessive praying feels more faithless and frantic than powerful and effective. God's been showing me that it's because of my unbelief. Ouch, right? Here's a link to the blog I've been following about that orphanage. If you dig around on that site very much you are going to find words that you don't like. Just be warned. But do ask God to provide everything these kids need, protect them, and get them home to America where they have families waiting to adopt them. Thanks, y'all. I knew next to nothing about Haiti until I started blogging a few years ago. I really don't remember how, but I started reading the blogs of Jamie Ivey and Debra Parker. Both of their families had set out on the journey - and it is a very long journey - of adopting children from Haiti. The Iveys finally brought their little girl Story home a couple of months ago. They are still waiting for their Haitian son Amos to be able to come home. The Parker family is waiting to bring home their son Ronel. Both boys are living at the Real Hope for Haiti Rescue Center. To the praise of God, the rescue center was still standing after the earthquake and none of the children were hurt. Thank You, Lord Jesus. They have 50-60 children and a few adults under their roof at any given time. I have the pleasure of now knowing Debra in person because she moved to the Houston area around the same time that we did. I have not had a chance to meet Jamie yet but I look forward to our paths crossing someday. I have a lot of respect for both of these families. I can't even imagine the anguish they were experiencing after they heard about the earthquake and didn't know if their kids were okay. I know they are still aching very badly for this country, as we all are. The Iveys and the Parkers were featured on their local news programs yesterday. Isn't that awesome? Here are the links if you want to check them out. *Also, don't miss this post on Shaun Groves' blog. 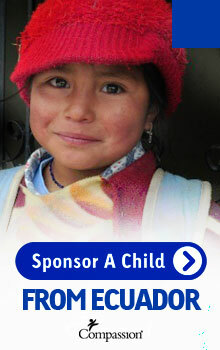 You can get a "Help Haiti" Compassion banner for your blog there. Mark it down. It's a Jones family record. We have eaten at home for almost every single meal since we got home from Missouri last Wednesday. The exceptions were one working lunch each for Curtis and me and one homemade dinner at my mom's house. But still! I'm so proud of us! Let's be honest, I'm proud of myself for cooking. I was having a self-congratulatory moment this morning when I figured out that I still have ingredients for one more dinner before I have to go to the store again. It was cut short by the realization that the only room in our home that is in order is the kitchen. Our Christmas stuff is gone but we are about halfway unpacked and there is laundry everywhere. On top of that, I have not gone running since we've gotten home. WHY CAN I NOT DO IT ALL?!?! Okay, I feel better now. I think. I was still in a good mood this morning even though my conceited little bubble had burst. I set the breakfast table for Jackson, Annabeth and I to eat together. Annabeth would feed herself bananas while Jackson and I ate toast and talked about dinosaurs and monsters. Then Jackson started to complain that I had cut his banana in half and given part of it to his sister. He also wanted his toast dry and not with honey. He had nothing good to say about his breakfast. So I sent him to sit on the steps while I ate in peace. Sweet Annabeth was still with me. But she hated her bananas and starting dropping the pieces on the floor. I had to remove the tray. I finished my breakfast. Jackson was invited back to the table. I then fed the baby some yogurt. Which Jackson wanted. He ate two bites of his breakfast. I noticed Annabeth's nose was running profusely and she seemed flat. Another cold. Jackson's cold has settled into his chest and he's coughing a lot. I hate to admit that cold and flu season has me wishing for summer. Did I just say that? What has become of me? Maybe I am being driven to insanity by my scabbed-over knuckles and bleeding lips. My body is in total humidity withdrawal. Humidity is somewhat like crack to Houstonians. We hate it but we neeeeeeeeeed it. Another thing that might land me in a special home is the fact that I have given up something very dear to me for the new year. Are you ready for this? French fries. I have not had a french fry since December 31, 2009. The Lord has enabled me, y'all! Gotta run. Snotty Girl has just pulled up at my chair and the aroma suddenly filling my personal space is rank enough to make a grown man cry. Normally at this time on a Sunday morning I'm in the frenzy of packing a diaper bag, locating my smallest Bible to stuff in my purse, and trying to come up with outfits for myself and the kids. Curtis dresses himself most of the time. Today, however, I am staying home with the kids. Right after Christmas Annabeth came down with yet another cold - the third or fourth in the same amount of weeks. I sort of lost count. Then she passed it to me around New Year's Eve and it knocked me out. I felt so sorry for her when I realized how horrible she must have been feeling but couldn't tell me. Now Jackson seems to have it. He woke up three times last night crying. So even though I would love to be going to my wonderful church this morning I am going to stay here and shower my little boy (don't tell him I called him little) with love and care. Annabeth is going to stay home too. The bright side is that maybe she won't get another cold this week! What she is getting is another tooth for a grand total of three. A certain question has been running through my mind since before Christmas. What would it be like to know that you sinned but there was no way to be forgiven? A couple of months after Annabeth was born I was trying to get back into aerobics. One evening I jumped in my Jeep with a smile on my face and a hop in my step and headed to the gym. I took a shortcut through my neighborhood, but I immediately realized I'd made the wrong decision when I saw about ten kids playing in a yard next to the street. If I'd seen them I would have taken a different route. I drove very slowly until I passed them and then I picked up speed (although I did not even reach the speed limit). All of a sudden a little dog came running down a driveway toward my car, barking all the way. I slammed on my brakes but I couldn't avoid him. To my horror, I hit the dog. A terrible chorus of ten children screaming - including those of the dog owners - filled the street. It was one of the worst moments of my life. One of the boys who lived there went running through the front door that had accidentally been left open and got his parents. They came out and got the dog who was still alive but was writhing in pain and crying. The other little boy was in hysterics. I stood in their driveway trying to apologize and explain but no one could speak to me. "What can I do?" I begged. I was completely devastated. Not only had I hurt and possibly killed this dog, but I had hurt this family and traumatized all of these kids. They would be able to look down a long street and see my car - the instrument of destruction - parked in our driveway. I was convinced that we'd need to move because I would be known as the wicked witch of the neighborhood. My kids would probably be bullied and have no idea why. But I would know. It felt like my life was over. I went to the store and bought a card. I wrote a note about how sorry I was and how I would be praying for the dog and their family. I included my phone number in case they wanted to call and yell at me or to tell me how the dog was doing. I couldn't bear to show my face there again, so Curtis took it over. I wanted him to tell them how sorry I was. They weren't home, so he left the card on their doorstep. Later I called my friend who lives near that family. I told her what had happened. "That was you?" Word had traveled fast. She'd heard that the dog was in rough shape. I felt sick. I know in my mind that there was nothing I could have done to avoid the dog. I wasn't speeding and I wasn't being careless. As my friend suggested, maybe the Lord would use it to teach the children to be careful around the street. Even so, my heart desperately craved forgiveness. It never came. We never heard from the family. Thankfully, I did hear from my friend that the dog was going to make a full recovery. That was such beautiful news to my ears. We have even seen the dog being walked down our street. I've wondered if they recognize my car in the driveway. Are they still mad at me? Were they ever mad? I know it's selfish to think of my own emotional needs in a situation like that. I have chosen to release it to God and move on. Although I promise you I do not take that shortcut anymore. Last week at Passion we heard the story of 30,000 children in Uganda who were kidnapped by a rebel army and turned into soldiers. They were forced to torture and kill others, sometimes starting with their own family members. These are the Invisible Children you may have heard about. Many of them returned to their homes upon release and found that their parents were dead. A husband and wife named Gary and Marilyn Skinner have taken in some of these children and put them in homes with a loving mother. They found these child soldiers wandering the streets with blood on their hands. There was no one to wash it off. They had nowhere to bring their guilt. The Skinners knew better than that. They are teaching them about the hope of Jesus Christ. These boys and girls who have carried the guilt of violent bloodshed have been told the good news that Jesus can forgive them. God loves them. They can be made into new creatures and they can stand righteous before God. They can be justified and renewed. Is there anything more glorious? Imagine that you are eight years old and you have been made to kill a little baby with a stick by some sick man standing over you. Your life feels like it is ruined forever. You feel worthless and guilty. But a Savior reaches out to you. You are rescued from guilt, condemnation and despair. Without the birth of Christ, without His sinless life, without the horrible death He suffered on the cross, without God's wrath toward our sin that He endured, without His resurrection from the dead, we would remain in our iniquity and guilt. We would stand guilty before Almighty God with no way to be forgiven. But WITH these things there is grace, forgiveness, life, beauty, wholeness, restoration, and innocence. Thanks be to Jesus Christ our Lord who has rescued us from our sin and guilt. He has made peace between us and the Father by His own blood. When our faith is in Jesus, we are justified in the sight of God. Instead of our sin, the Father sees Christ's righteousness. I don't know where you're at right now. Maybe your heart is overwhelmed with guilt and shame over something in your past. Or in your present. I've been there. The Bible says that we've all sinned. No one is exempt from the corruption that is born into the human heart. The good news is that anyone can receive forgiveness through faith in Christ. You can have it right now. He delights to give it to you. We were told that one of the head soldiers in charge of training these children to kill and destroy has given his life to Jesus. Time and time again I am struck by how divine the story of the Gospel is. It did not originate in the human mind. No man could invent something so beautiful. Merry Christmas and Happy New Year! Oh wait, it's already January 7. My bad. We got home from Missouri late last night and my house is out of control. Everywhere I look there are presents, suitcases and laundry, laundry, laundry. There's a dying Christmas tree in the corner and no amount of whining is going to make it walk itself to the curb tomorrow morning. But the most important thing is that we have groceries. Houston will be experiencing A BIG FREEZE OF DRAMA AND COLDNESS AND ICE this weekend and I have made sure that we have enough food to eat at home for the next four days. If we do that, it will be record breaking. Also, when you return home after 12 days of being gone and your white bread is still quasi-soft and not moldy, it is both wonderful and disturbing. I'll end with this. In the last few minutes of our 13-hour road trip yesterday, Curtis and I were feeling a bit delirious. It was almost midnight and the kids were asleep in the back seat. Jackson began to snore a little, which made us laugh. Then I imagined what his wife would think about his snoring one day. (I was pleasantly surprised on my honeymoon to find that Curtis doesn't snore.) That led me to think about how I haven't been very good about praying for Jackson's future wife. Suddenly I sensed the beginnings a panic attack. What if my children's future marital happiness depends on my ability to remember to pray for their spouses before they're even in elementary school? I said, "Babe, we really need to be praying for Jackson's future wife." Curtis looked at me with his head cocked to the side and one eye squinted and said, "Are you serious? We're just trying to survive his third year!" And then I laughed so hard I snorted. Jackson must get it from me.